This time they find heather the violet fairy. can heather get back to her sisters? find out in this great book! Sooooo good. The final battle for the rainbow fairys. This book is reeeaaaaaaaallllly good and it is the last of the Rainbow Fairies set, bye ;)Really Good! Violet is my faviourte colour. i liked it cos violet is my 3rd fab courler and here is some of the fab story “I can`t belive this is is last day of our holiday!” said Rachel Walker.She gazed up at her kite as it Rose in the clear blue sky. Kirsty Tate wached the Purple kite soar above the field beside mermaid cottoge. “But we still have to find Heather!” she reminded Rachel. this book is realy good 4 some1 whe likes fairys. but i dont like fairys. i only read it cuz the fairy has the same as me. I really loved this book and it is my second favourite of the series. My favourite part was when all the sisters found each other and the colour came back to fairy land. 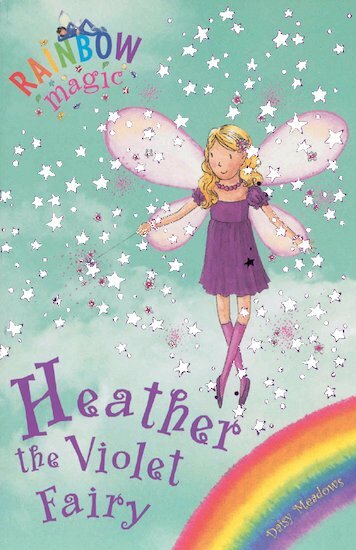 I like this book and I really want to read it because she’s the last Rainbow Magic fairy and my favourite colour is violet and I love her.I love Heather the Violet fairy! I liked it because it is quite short but has a good story background I like the bit where they meet the squirell fluffy and when they meet queenie the bee.